In addition to creating fine art pieces and commercial illustrations, I also take on private commissions. If you are interested in commissioning a unique piece of artwork, please do get in touch. Born in April 1989 Collette June Ellis grew up surrounded by the spectacular landscapes of North Wales, UK. Her work is often inspired by fantasy and mythology, drawing inspiratio… Show more. Send a message directly to Collette Ellis. Born in April 1989 Collette June Ellis grew up surrounded by the spectacular landscapes of North Wales, UK. Her work is often inspired by fantasy and mythology, drawing inspiration from ancient cultures and a variety of countries. ‘The Hobbit’ by J.R.R.Tolkien was her favourite books as a child and she later fell in love with the artwork involved in ‘The Lord of the Rings’ movies and the work of Japanese film director Hayao Miyazaki. 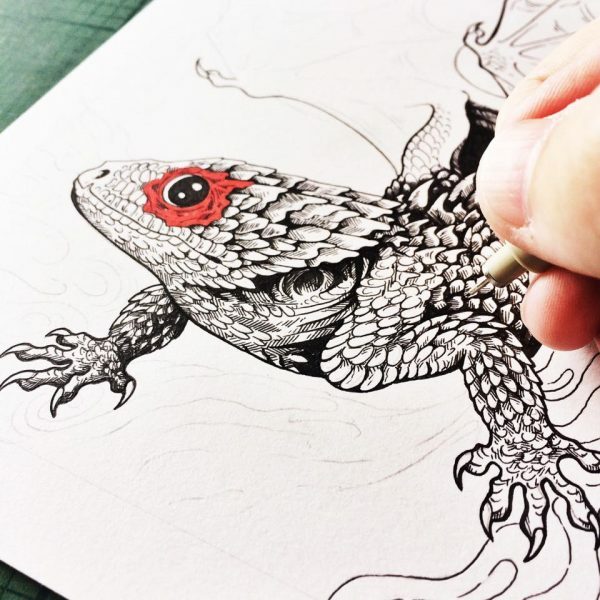 Collette attended Glyndwr University in Wrexham and achieved a Masters in Design Communication: during which, she travelled to China after being awarded a grant by the Welsh Livery Guild to investigate dragon legends in both countries. She has exhibited at various conventions across the UK, including London, Manchester and Cardiff Comic Cons. In October 2016 she opened her third solo exhibition in the Oriel Yuys Mon on Anglesey, featuring a number of 3D touchable sculptures depicting mythical Welsh creatures. In 2016 Collette also launched her first illustrated book via Kickstarter which explored the monsters and mythical beasts of her home country of Wales: www.kickstarter.com/projects/collettejellis/an-illustrated-guide-to-welsh-monsters-and-mythica Over the years Collette has worked on numerous publications for authors and album covers for musicians. She has also worked for The Knight Shop Int and the British Heritage Societies, producing decorative parts for swords and armour. In the past Collette has been lucky to have been featured in several online blogs and magazines, including Imagine FX , Y Lle’ an arts program on Welsh TV channel S4C and has appeared on the BBC 'Wales Today' Show. ​In her spare time Collette is an active member of her local HEMA (Historical European Martial Arts) group and volunteers at her local wildlife rehabilitation centres.